By Karrar Haider in Mobile. Updated on November 10, 2017 . There are dozens of apps and websites to download ringtones and use it on your Android phone. However, there is a chance the ringtone of your favorite tune may not be available, or not created to your taste. If that’s the case, then you can also create your own ringtones from your favorite songs and melodies. In today’s post, I will show you how you can create a ringtone out of any audio file and do it without spending a penny. To create ringtones on your Android phone, you’ll need a third-party app. There’re many ringtone creator apps available on Google Play Store, but I found Ringdroid to be the most reliable one. It is an open-source app that is completely free to use and doesn’t contain any ads. On top of that it is astonishingly easy to use, so we will be using it for demonstration purpose. Although, if Ringdroid doesn’t work for you or you are looking for more features, then there are other options as well. Ringtone Maker and MP3 Cutter are also great apps that are free (but ad supported) and have reliable features. Install and launch Ringdroid and it’ll automatically list all the audio files in your phone or SD card in its interface. If you can’t find your required tone, then tap on the "Menu" button on the top-right corner (three vertical dots) and select "Show All Audio" option. This will search and list all the audio files to ensure nothing is missed. Do keep in mind that Ringdroid lists all of the audio files in your phone, including system sounds and other app UI sounds. Try not to get confused and use the "Search" bar above (if necessary) to quickly search for required audio files. To start creating the ringtones, tap on the audio file that you want to customize and it will open up in Ringdroid editor. The audio file will be shown as waves with two adjustable sliders on it to specify the start and end point. Below you will see "play/pause" buttons and "start/end" time in seconds. 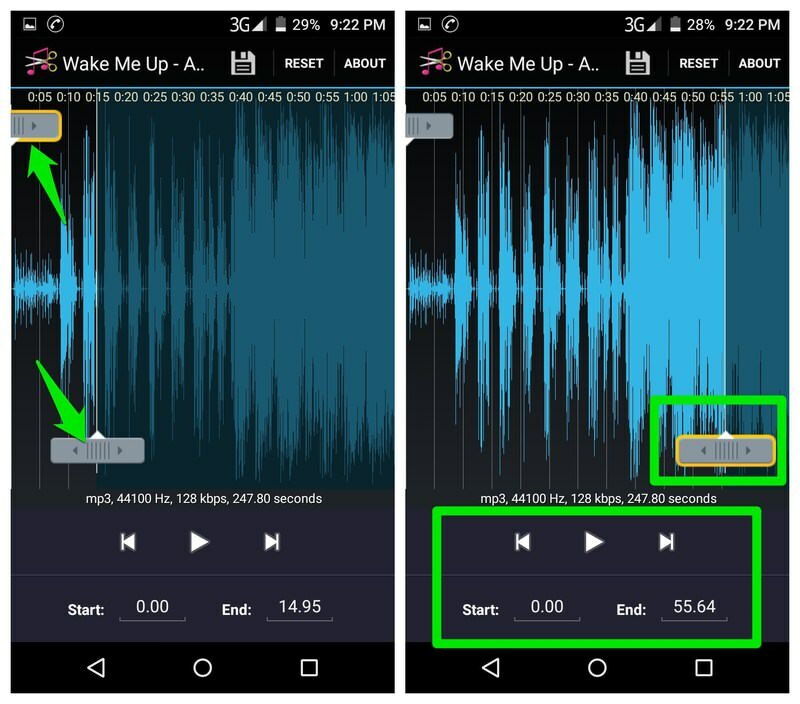 There are multiple ways to specify start and end points to extract the ringtone out of the audio file. 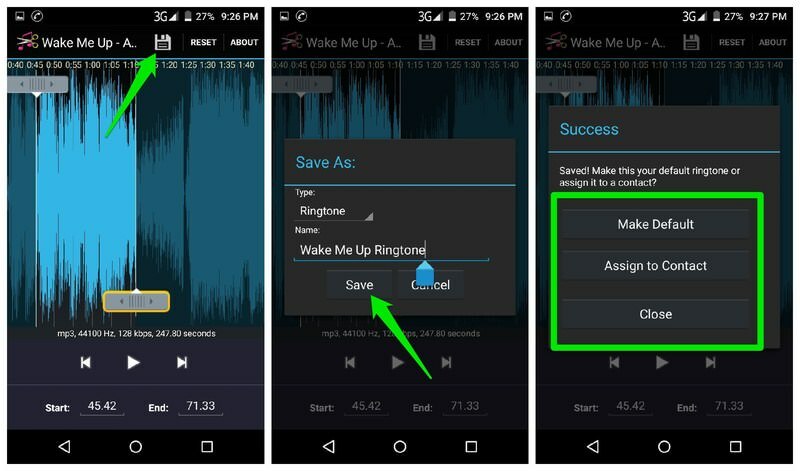 You can use the start and end sliders to specify exact start and end point of the ringtone. It will become easier if you play the audio file while doing so to pinpoint the location. Although it is not necessary and you can also specify without playing the audio. Another precise method to do this is to play the audio file and tap on "Start" button as soon as the starting point is played. Similarly, tap on the "End" button when the ending point is played. This method is a little slower, but you will get precise start and end points. And of course, you can also manually enter the starting and ending points in "Seconds" by tapping on the counter next to "Start" and "End" buttons. You must know the exact start and end points in seconds to use this method. Once the start and end points have been specified, tap on the "Save" button above to save the ringtone. You can now give it a name and set it as default ringtone. This is pretty much it, the ringtone will be created and saved as a separate file from the original one. 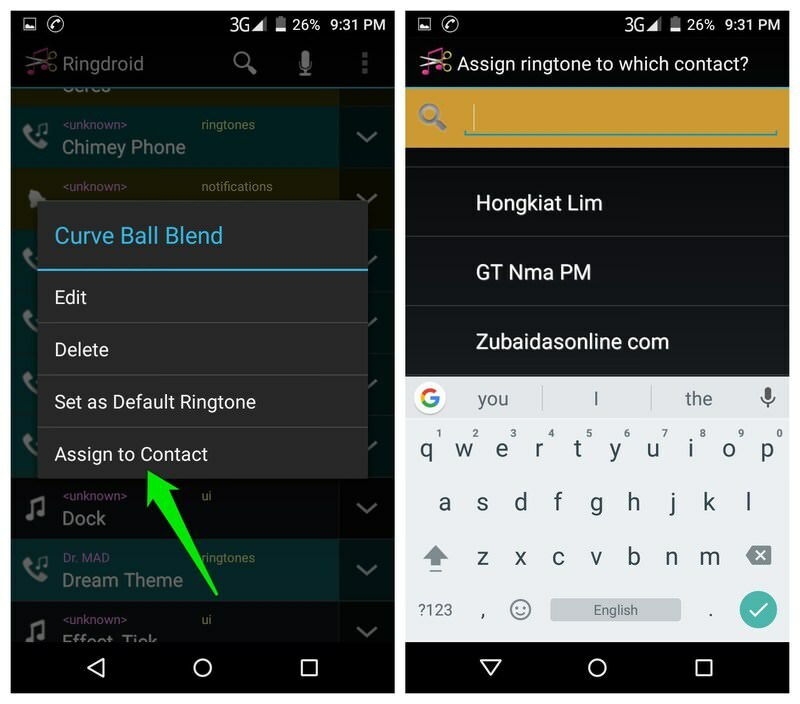 Ringdroid also has some other handy features to use it effectively. Below is an explanation of each option. The search bar in the main interface is really handy and does a great job of finding the right audio file. 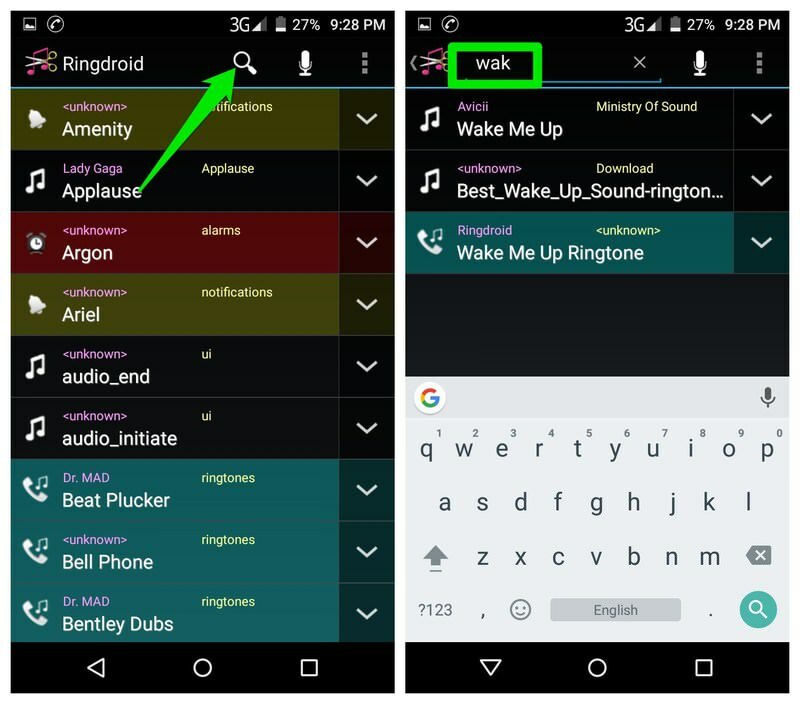 As Ringdroid loads all types of audio files stored on your phone, most probably you will need the help of this "Search" bar. The Search bar updates in real-time and you can search files with both title name or artist name. 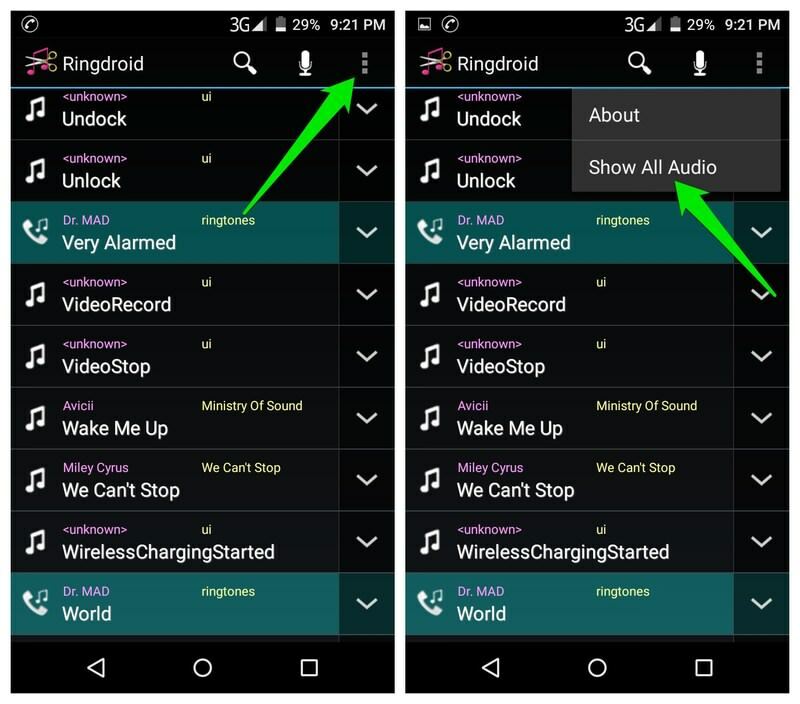 You can set an audio file as default ringtone, notification tone or alarm tone right inside the Ringdroid interface. 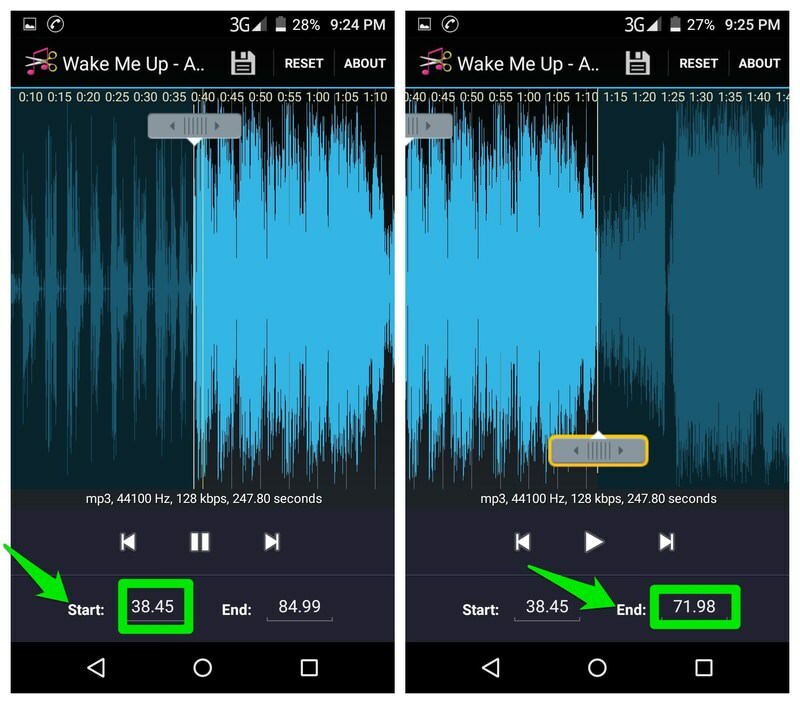 Simply tap on the upside down arrow next to the audio file and select "Set as default". If the file is a ringtone, then you can also assign it to specific contacts to easily identify them. Tap on the upside down arrow next to a ringtone and tap on "Assign to Contacts" option. Now just select the contact from the contacts list to assign to it. You can also record audio to create ringtones out of it. 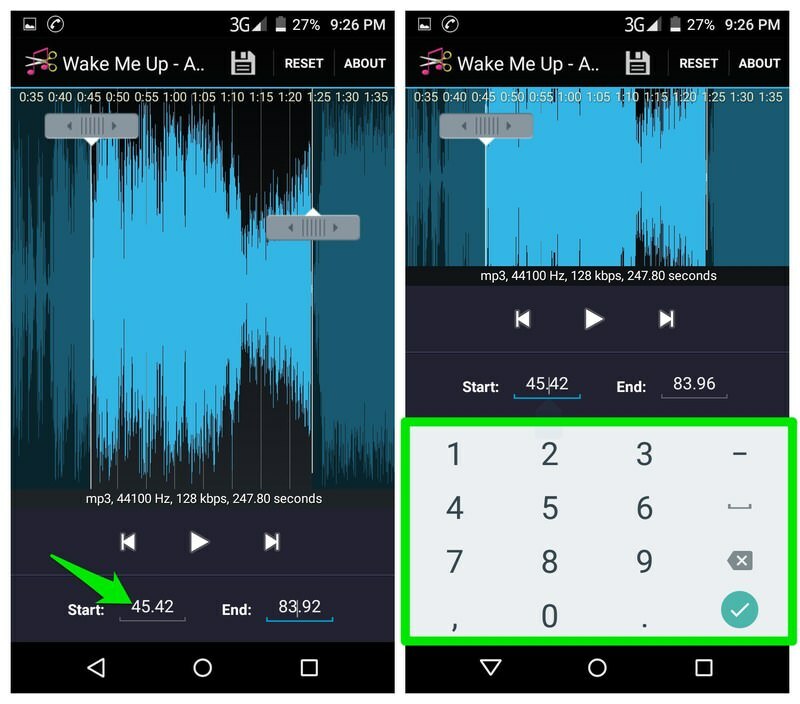 Tap on the "microphone" icon at the top of the interface and the recording will start. Record whatever you like and then tap on the "Stop" button when you are done. 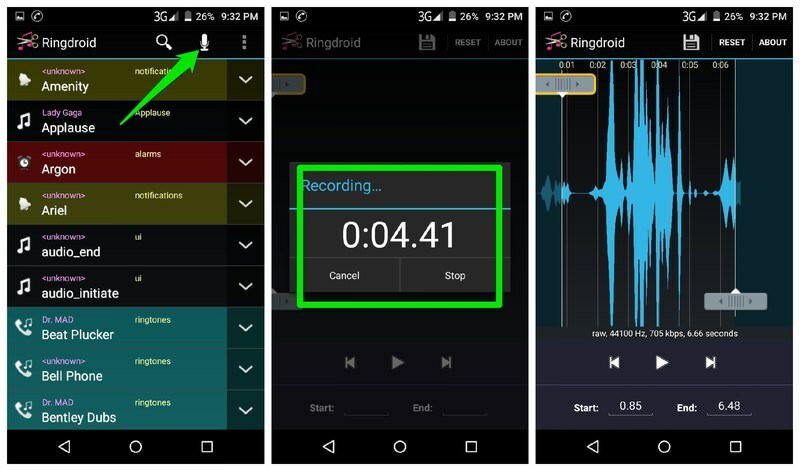 The recording will automatically load in Ringdroid editor where you can edit and create a ringtone. 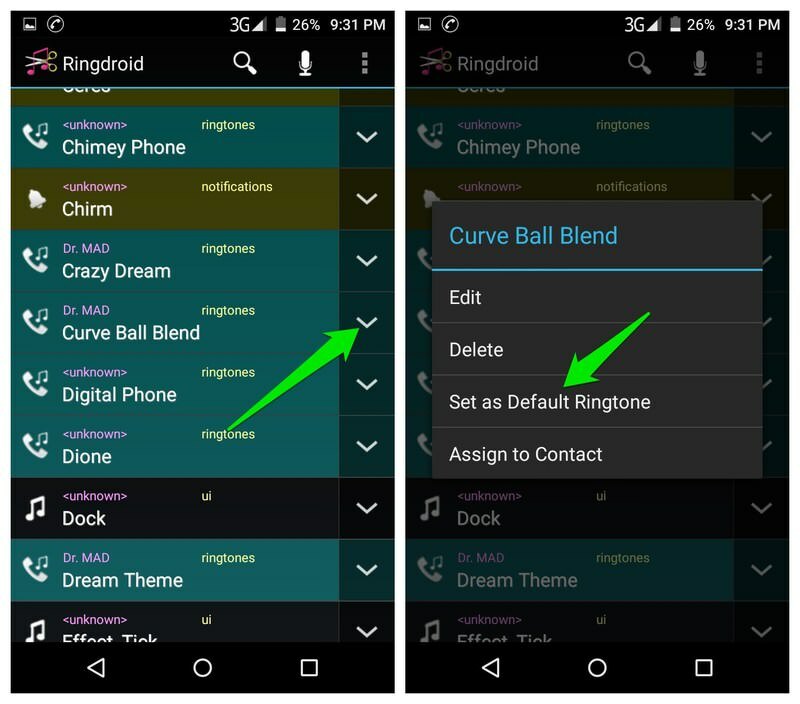 I found Ringdroid to be very fast and simple to create custom ringtones on Android. Being open-source and not supported by ads is a plus point as well. 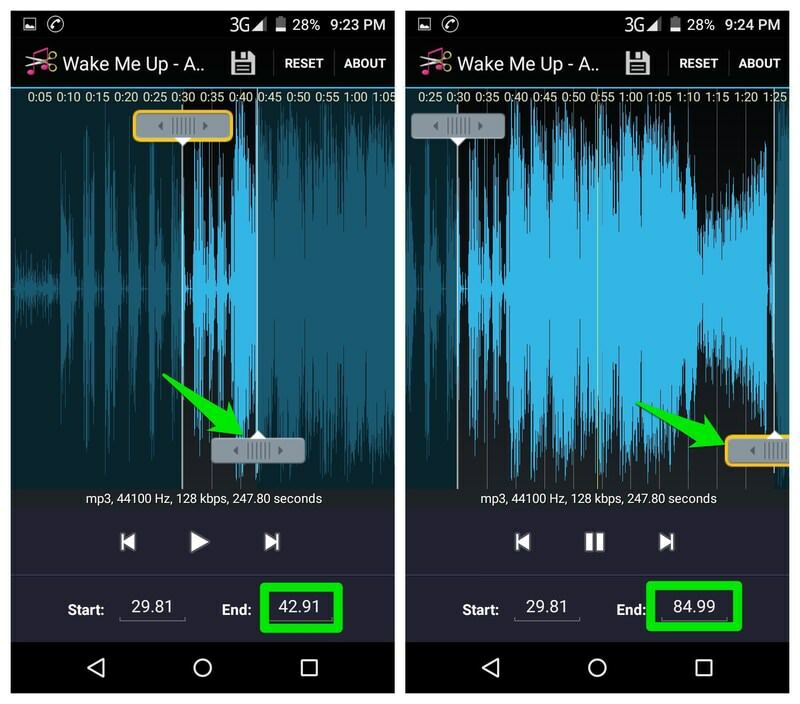 Although if you want even more control, such as the ability to adjust volume or fade in/out time, then Ringtone Maker is a really good option as well.